Your body is far from perfect. You’re the product of millions of years of evolution, but this process doesn’t strive towards “perfection”. In fact, it doesn’t strive towards anything. It just happens: because there are differences between individuals in a species, and some have better chances of surviving and reproducing than others. There’s never a goal in mind. All that matters is those chances of survival and reproduction: a game played out in the moment, between organisms and their environment. Looking in detail at human anatomy, I’m always left with two practically irreconcilable thoughts: our bodies are wonderful, intricate masterpieces; and then – they are cobbled-together, rag-bag, sometimes clunking machines. There are so many bits of anatomy that could be much better designed. If I was an intelligent designer of humans, I’d switch the retina around to eliminate the blind spot where the nerves leave the back of the eye; I’d put a little pump in the leg veins to help the blood back to the heart and lower the risk of deep venous thrombosis; I’d stick in a really good link between the two coronary arteries, so that if one became blocked, the other could easily take over; and I’d sort out the spine to reduce the chances of back problems. Some of these are niggling problems, some can be life-threatening. But they don’t seem to have greatly affected our ancestors’ chances of survival and reproduction, so natural selection hasn’t “noticed” them – and we’re stuck with them. The spine is a great example of something that straddles this perceptual divide: it looks like a consummate piece of engineering genius, but it seems almost designed to fail. At least, it seems to be designed to fail with age; it comes with built-in obsolescence. The vertebral column is made up of 33 vertebrae. The lower ones are fused: five to form the sacrum, and the last four as the coccyx. The 24 vertebrae above the sacrum are separate units. Each vertebra is joined to its neighbours, above and below, by small synovial joints towards the back. These permit a certain degree of movement between each pair of vertebrae. But the main weight-bearing joints of the spine are the pillows of cartilage – the intervertebral discs – between the bodies of the vertebrae. These discs consist of a fibrous outer ring, which itself consists of annular layers, like an onion. The centre of the disc is different: gel-like, something like the consistency of toothpaste – held in place by that fibrous outer ring. The gel helps to spread the load across the surfaces of the opposing vertebrae. At least, that’s how a young disc works. As you get older, your discs get older with you. And, fairly inevitably, they start to degenerate. The nucleus dries out and instead of spreading the load so evenly, allows peaks of pressure to develop in the disc. Minute fractures can appear in the surface of the vertebrae, and eventually lead to small pits, with the nucleus pushing up into the vertebra itself. These pits are called Schmorl’s nodes. Cracks in the outer fibrous ring allow the inner nucleus to herniate through, creating what’s commonly known as a “slipped disc”. Such protrusions can press on spinal nerves, and so it’s not surprising that this can be painful. When I’m looking at archaeological human remains, I can pick up some signs of this type of degenerative disease. I’ll never know if someone suffered from a slipped disc – that’s all soft tissue. But I can see where the joints are starting to lose it, and extra bone builds up around the edges of the vertebra – “marginal osteophyte” – as if in an attempt to stabilise a failing joint. And I can certainly pick up Schmorl’s nodes, punching into the end-plates of vertebrae. These are relatively common lesions in older skeletons. A couple of weeks ago, I had the chance to look at my own spine in a way I’d never done before. Early one Saturday morning, I headed to Cheltenham, to the Cobalt Imaging Centre, for a hot date with their 1.5 Tesla MRI scanner. I was going to have what amounted to almost a full body scan – from my neck to my pelvis, missing out my head, arms and legs. This was all for a talk about anatomy – my anatomy – for the Cheltenham science festival, on 5 June. I was really intrigued to get this opportunity to look inside my body – and to see bits of myself for the first time. And yet, as I drove up to Cheltenham that Saturday, I approached my appointment with the massively powerful magnetic machine with trepidation. The people at Cobalt were going to see right through me – what would they find? In a recent study of 666 apparently healthy people, 659 of them had some kind of incidental finding – some very minor, others very serious. I lay in the open-sided scanner, listening to the clanking of the machine around me, and wondering what it was seeing. The scans of my lower body seemed to take a long time. Eventually, after about two hours, I met up with radiologist Iain Lyburn to look at my scans. There was something wrong. We were looking at a sagittal slice through my body, right through the middle of my spine. I could see the plump intervertebral discs, each with a juicy, pale grey centre – right down to the last but one. This disc, L4/5, lying between the fourth and fifth lumbar vertebrae, was black. It had also punched up into the body of L4, the fourth lumbar vertebra, above it. And it was herniated – I could clearly see a bubble of black pushing out beyond the vertebrae at the back, uncomfortably close to the lumbar nerve roots. Iain was very kind. I was quite sanguine. I’ve had back pain on and off for years. Having children and then carrying them around certainly hasn’t helped. I knew I had a bad back. Now I was seeing it. The scan has made me more careful of my back. I tended to dismiss it as just muscular before, and to carry on doing things that were a little bit painful. So I won’t push my back in stretches now. I won’t do high impact aerobics – there’s plenty of other exercise I can do without hurting my back or making it worse – and, with some reluctance, instead of carrying my toddler to his bed and lying him gently down, I ask him to climb in himself. 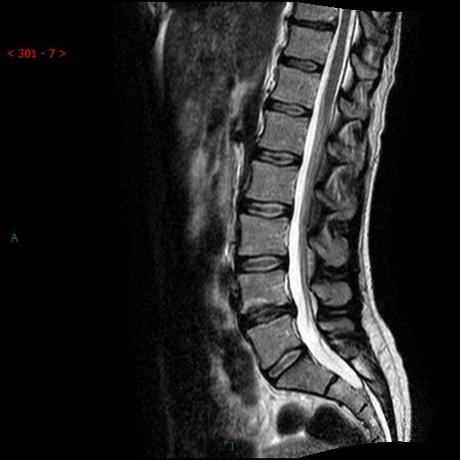 It’s interesting, this completely degenerate L4/5 disc, ink-black on the MRI. It will never not be degenerate. I just have to live with it. It’s part of my body’s built-in obsolescence. When I was in my 20s, and even though I was studying medicine, I didn’t ever really think that my body would fail. Now I’m in my 40s, I have to face a different reality – I, like everyone else, am slowly falling apart. There are plenty of things I can do to reduce the rate of decline, but I can’t stop it. As far as evolution is concerned, I’m not perfect at all. I’m just about good enough. And I’m mortal.